Sometimes the box score just doesn’t tell the story. For example, last night’s. You see there that Chris Bootcheck went 6 1/3 with a no-decision and Cory Wade went 2/3 for the win. By the rules of the game, that is an accurate report. What’s missing is that reliever turned starter Bootcheck had his best game yet and probably should not have even started the 7th inning. With the score 4-1, Bootcheck hit the first batter who then moved to second base on a sacrifice. The next batter got a contentious walk, leaving runners on first and second, one out. The Bulls, who have been pulling off double plays like clockwork this home stand, didn’t get a chance to do that this time. Cory Wade came in and gave up a game-tying three-run homer. So there’s a no-decision for Bootcheck and a blown save for Wade. However, Wade was still the pitcher of record when Russ Canzler’s single drove in Desmond Jennings in the Bulls half of the 7th. So Wade gets credit for the win. Columbus has apparently had someone developing “spray charts” for the Bulls’ hitters. We are seeing some very odd shifts for some, but not all, of our left-handed batters. Sometimes just the infield shifting and not the outfield, sometimes just the outfield, sometimes both. The shift against Dan Johnson, however, gave him a freebie when a simple pop-up over third base, typically easily handled by either the shortstop or the left fielder, fell in for a hit (the shortstop was playing behind second base). Please, please, please let’s not disturb whatever is keeping Ray Olmedo locked in. He was 3 for 3 last night, and sacrificed the eventual game winner to second, pushing his batting average to .301. Yes, he bobbled a grounder in the 6th, but he redeemed himself the very next play. With Chris Carter out with a hangnail, we’re seeing some interesting guys in the outfield. On Monday and Tuesday it was J.J. Furmaniak in right field. Last night it was Omar Luna in left field. Both of them have done just fine. Because of that double header in Toledo on Sunday, the Bulls don’t have a starting pitcher ready to go for tonight. Instead we’ll see relievers out there for short stretches. Still, we’ve beaten the best team in the International League for three games so far, let’s go for four. The Bulls are still wearing those ugly, illegible jerseys. The field needs a rest! ACC tournament really messed things up out there. Hope it was worth it to the DBAP’s bottom line. 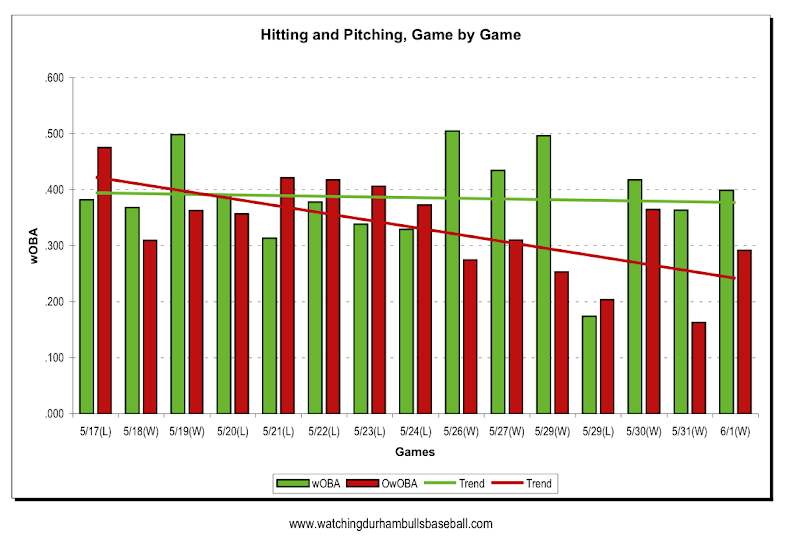 This is the last 15 games with the wOBA and OwOBA plotted for each game. Remember that team wOBA is a pretty good measure of hitting and Opponent's wOBA is a decent measure of our pitching and defense. Bigger is better for wOBA (green), small is beautiful for OwOBA. Then a couple of simple trend lines for those 15 games. 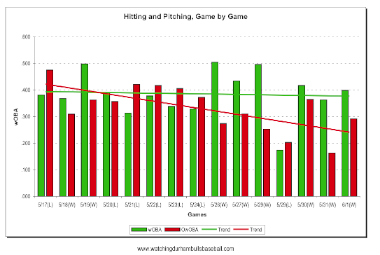 That dropping OwOBA trend is saying that our pitching and defense has really improved over the the period while our hitting/getting on base has stayed at a very respectable level. This is a very positive looking situation. Hope they can keep it up.